Leading rug and carpet brand Louis de Poortere specialises in beautiful rug ranges and stair runners, lush carpets and exclusive fabrics. Its penchant is for delicate floral patterns and fascinating oriental designs, as well as retro and vintage styles and colour combinations. Louis de Poortere rugs utilise only the finest materials and always strive to showcase the unique, the different and the trend-defying, rather than the generic. These features prevail in the Louis de Poortere Fading World collection, as well as many of its other De Poortere Deco rug and carpet ranges. 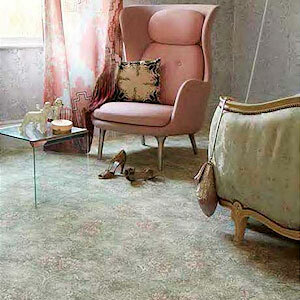 If you are looking for Louis de Poortere rugs and runners, then Vale Furnishers has plenty to offer. As a leading Louis de Poortere stockist, we have an extremely lavish collection of exquisite De Poortere Deco rugs for sale in the UK, many of which beautifully bedeck the floors of our two showrooms. These include the prestigious Silver Lining Collection and BoBohemian Collection.